But while Sara and Jack remain convinced they are completely mismatched, the Wizard Council feels otherwise. A dark force is killing some of the world’s most influential wizards, and the ex-lovers have just proved their abilities are mysteriously amplified when they work together. But with the fate of the world at stake, will the violent emotions still simmering between them drive them farther apart… or bring them back into each other’s arms? Adair did an awesome job fleshing the characters and world out. I loved Jack! Charming, witty, strong, capable, funny and realistic. Even though Sara was a hypocrite… I’d still hang out with her. She has good fashion sense, and she can be funny when she wants to be. We wouldn’t be BFF’s or anything, but she’s okay. As for the environment, it felt like I was there. I could feel the humidity of the jungle, smell the earthy smells that Adair was describing, etc. It pulled me in and made it seem like instead of reading, I was experiencing right alongside the people. Not many authors can do that for me, I mostly stay detached from what I read. I could have done without a lot of the woo-woo magic stuff personally. But then, I guess, it couldn’t really be called a paranormal romance in that case. Honestly, I bought the book because I was familiar with Adairs early works, and didn’t bother reading the back blurb. It was good, don’t get me wrong… but I prefer books that have some semblance of realism in them. Also, the overuse of acronyms seriously got on my nerves by the end. It would have been fine if it was a characters thought or dialogue, but since it was neither… it was fail. And finally, the cover. Not my cup of tea. Too dark. 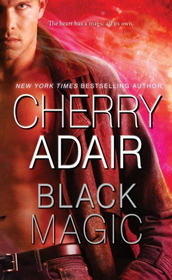 Hmm, It was hard rating Black Magic, but I think I’m being fair giving it a C. I’d recommend it to fans of paranormals, Cherry Adair, and adventures though. His pheromones didn’t just call softly to her pheromones; they stood on a mountaintop and yelled her name.